We left the German Treffen and went to our friends Dirk and Hetty's house in Holland and dropped off about half of the load in the trailer. We had souvenirs from as far back as Belgium, two days after we had left their house in March, and it is now the end of May and 12,000 km. (7,500 miles) later. We then headed for Nordkapp (North Cape), Norway. The scenic route. 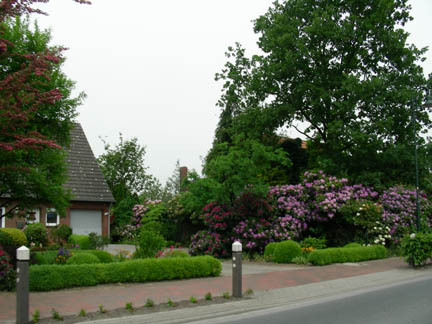 It led us through some small roads in northwestern Germany where the Rhododendrons were almost as tall as a house. There were probably 50 km. of flowers, both wild and cultivated and all in bloom. These flowers, the flat ground of the Low Countries and views of huge wind turbines brought us to Denmark in two days.